Bronze. Not a desired metal among athletes but one that's gaining popularity in the world of horology. I must admit I've also fallen for this alloy. After Panerai launched the PAM 382 a couple of years back, almost every micro and boutique brand seems to want a piece of the action. I have not seen many bronze offerings in person, to date but among those I have fiddled with, the Montres-Militaire range is truly among the better ones. 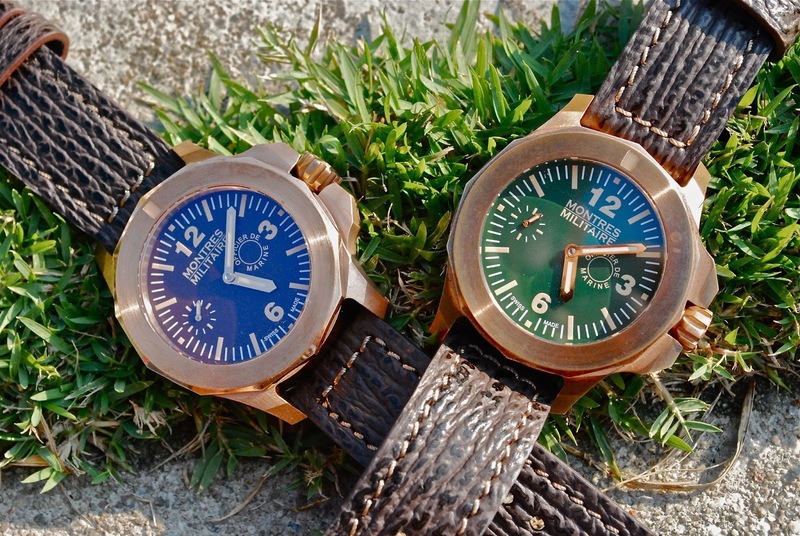 Montres-Militaire is a relatively new company. It's founded by Markus Tschopp with the first watch, the Officier de Marine being offered only in May this year. This particular offering comes in 3 dial colours - green (ref: 7101), black (ref: 7102) and brown (ref: 7103). These watches have been flying off the local AD's (Gnomon Watches) shelves since they were awarded the dealership about a month ago. I've managed to secure the green and the brown dial variants. Montres-Militaire has confirmed that each dial colour is limited to 799 pieces worldwide. The Officier de Marine is powered by a UNITAS 6497 movement. 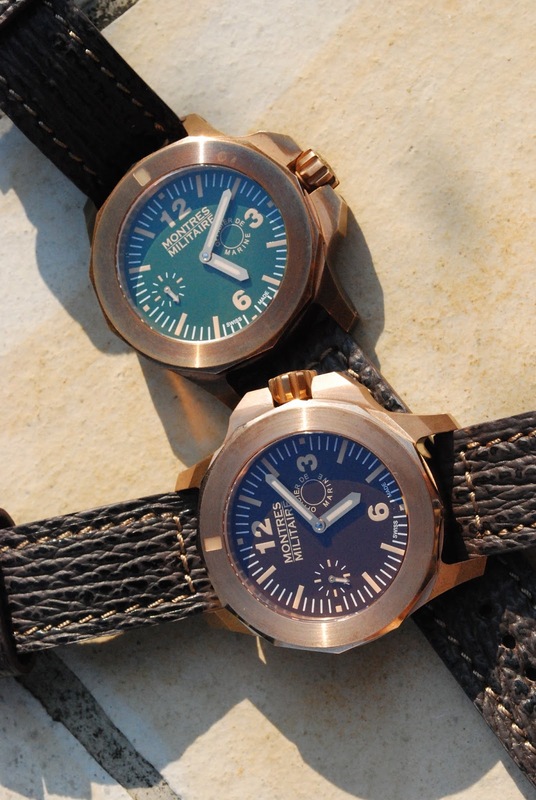 The 7101 has an olive green dial while the 7103 features a mocha dial. Gold Arabic (12, 3 and 6) and stick markers adorn the dial. All these are housed within a 47mm bronze case made up of tin and copper. However, the bezel kind if baffles me. Apart from the lumed pip, it is plain as a desert. The hollow ratcheting is not particularly awe-inspiring either. It sounds rather muted and hollow. But this is not a deal breaker for me. The large crown is shouldered by two relatively huge crown guards that complement the overall aesthetics. The ridged crown is easy to pull out and wind as well. The straps are secured by screw-in bars. The case is well engineered and precisely cut. The lines are neat and clean. The lugs are relatively short and tightly angled, thus ensuring an rather snug fit. In spite of the large case diamter, the watch is relatively thin. Not wafer thin but just right. The presence of copper is very obvious. It is hard not to notice. On the subject of colour, it is also very obvious from the photographs that the Officier de Marine patinas rather quickly. Considering I've only had the 7101 for about a month, it has actually started to turn darker. A lot darker. The 4-day old 7103 is is also showing signs of change as well, as evident in the photographs. The pre-v styled buckles are also made using the same alloy. This is a nice touch as it will mean both the case and the buckle will patina at similar rates. The stainless steel case back is signed with the Montres-Militaire logo in the centre and the usual literature on the circumference. The prominent deep grooves on the case back seems to suggest that a special tool might be required to open it. 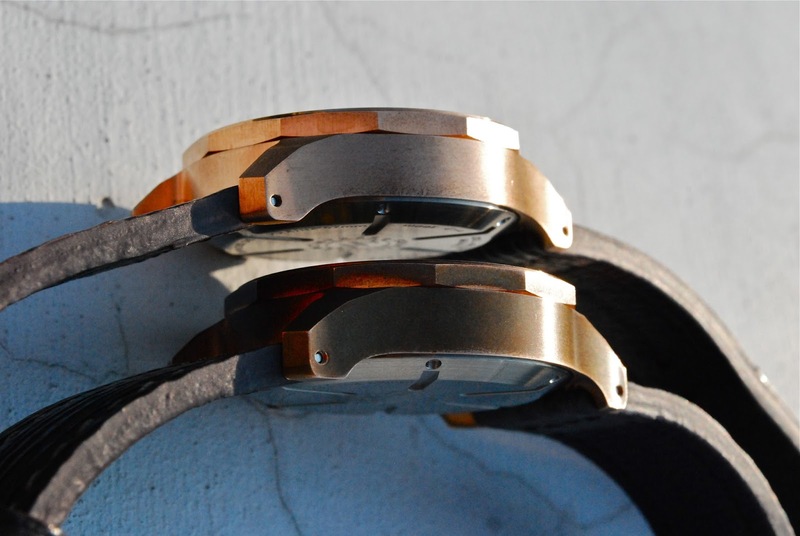 A stainless steel case back would also mean a smaller area, only the parts of the wrist that has contact with the bronze case will be stained. These watches are no slouch in the dark. They are as bright as neon tubes when fully charged. The baby-blue hue of the hands and pip is a nice touch that brightens an otherwise, monotonous lume. Despite the relatively huge 47mm case, the watch it sits rather snugly on my puny wrist. These coppertone babes are are really one of the better value for money offerings I've managed to get lately. For patina freaks, this is a must have. They age really quick. What also drew me to them are the great finishing and reliable movement. It's no surprise then, that these watches are often pre-ordered by customers at Gnomon Watches and leave the shop as soon as they arrive. Of the three variants, my favourites are obvious - green, brown, and followed by black in this order. If they ever make a black dial edition with rose gold casing, I'd scramble to the head of the line. I reckon the black and the brown will look really fantastic in a rose gold case. Her, Mr. Tschopp, I hope you catch my drift. Case Material : Bronze (Alloy of tin + copper). Case Back : Stainless Steel. Power Reserve : 46 Hours. - Fantastic looking conversational piece. - Stainless steel case back limits stain area on wrist. - Short, steeply angled lugs. - Limited to 799 pieces worldwide. - Muted and hollow bezel sound. - Only available in bronze. - Not made in rose gold for black and brown dials. Please take note that Montres Militaire has adviced that each dial colour is limited to 799 pieces globally, and not 799 for all 3 colours as I previously mentioned in the review. The correction has ben made in the review.